Heat an iron skillet or non-stick ovenproof skillet over high heat. Add olive oil and swirl to coat. Add flour tortilla to the skillet and cook for 30 seconds to brown the bottom. Top sauce with cheese. Add pepperoni on top of the cheese and sprinkle with Parmesan cheese and red pepper flakes. Put skillet in the oven and broil for 4 to 5 minutes to slightly brown the top. 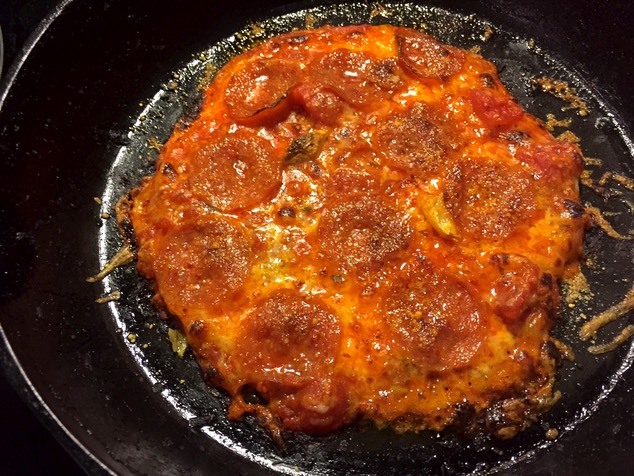 Remove skillet from the oven, put pizza on a cutting board and cut into slices. * Pizza maybe topped according to your personal taste. Try barbeque sauce and cooked chicken, or taco sauce and ground beef, or Alfredo sauce and cooked salmon or shrimp. A vegetarian pizza is also an easy option. The sky is the limit!